Between April 6th and April 8th, tune in for the NA LCS Promotion Tournament and see which three of the five competing teams will earn a spot in the NA LCS Summer Split! April 6th, 7th, and 8th will play host to the NA promotion tournament! The bottom three NA LCS Spring Split teams and the top two NA Challenger Series teams will face off to see which THREE teams will compete in the 2016 NA LCS Summer Split! Each of the four matches in the NA promotion tournament will be best of five. The NA Promotion tournament will be played on patch 6.6! 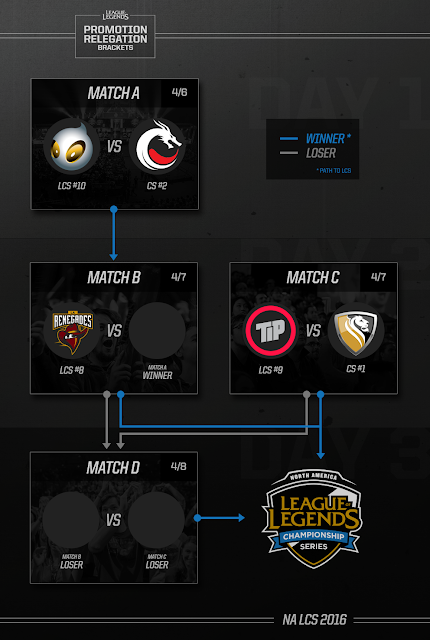 Check out the NA LCS Promotion Tournament primer for more information. For more esports action, remember to tune in this weekend on April 9th and 10th for the NA & EU LCS semifinals, followed by the finals on April 18th & 19th!